Norridge Gardens today announced it has earned The Joint Commission’s Gold Seal of Approval® for Nursing Care Center Accreditation by demonstrating continuous compliance with its performance standards. The Gold Seal of Approval® is a symbol of quality that reflects an organization’s commitment to providing safe and effective patient and resident care. Norridge Gardens underwent a rigorous on-site survey on February 12, 2019. 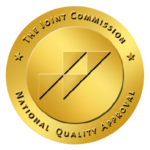 During the review, Joint Commission expert surveyors evaluated compliance with nursing care center standards related to several areas, including assistance with activities of daily living, coordination of care, and staff education and training. Surveyors also conducted on-site observations and interviews with leaders and staff of the organization. Norridge Gardens of Premier Healthcare is a 292 bed skilled nursing facility located in Norridge, Illinois, in the North West side of Chicago. Norridge Gardens is just north of the Irving Park and Harlem Avenue intersection. Our doors opened to serve the community over 30 years ago. Our foundation of excellence has generated satisfied families who have been repeated customers that desire Norridge Gardens for our quality care. Norridge Gardens has all the amenities of home to make your stay as comfortable as possible from our Tiffany Dining Room, live entertainment, religious services, a laundry room and beauty salon and barbershop. Our patio even has a clear view of the downtown Chicago skyline. Chicago is home to one of the largest Polish populations in the United States. Norridge Gardens specializes in serving the Polish community with cultural activities, language programs and services. We speak Polish. Chcemy mówić po polsku. Norridge Gardens provides health care to individuals in need of skilled nursing care for long term or for short-term and rehabilitation. Many short term guests who come here for rehabilitation choose to stay at Norridge Gardens long term for their care needs because they have experienced the quality of care and excellence in service. Healthcare services include Wound Care, IV and Nutritional Services, Drain Management, Respiratory and Tracheostomy care and Physical, Occupational and Speech Rehabilitation Therapy in a skilled nursing environment. Norridge Gardens has a secure Memory Care Unit with dedicated staff and programs. We excel in transitioning the patient from a hospital stay to a successful return home so the patient can maintain their independence. Polish culture and connections are an important part of Norridge Garden’s services. Family gatherings such as Mother’s Day, Father’s Day, Easter, Christmas, Smingus Dynguare and the Name Day tradition are celebrated with special invitations to encourage everyone to participate. Norridge Gardens hosts several Polish senior groups, which meet at the facility to enjoy meals and socialize. Polish language religious services are conducted by an area priest, which includes a Polish language mass. Many of the neighboring Parishes also send volunteers to connect with their parishioners at Norridge Gardens for a short or long term stay. We even hold our own version of Dozynki – Harvest Festival. Norridge Gardens has a dedicated Polish Relations Coordinator. We are happy to see that you are interested in our Norridge Gardens Work School Certified Nursing Assistant Program. Our Program runs about every 10 weeks and in order for you to be considered for this unique program you must apply for it. You can apply in person at Norridge Gardens— 7001 Cullom Ave. Norridge Illinois 60706 or online by clicking here. You must have a valid current Driver’s License or State ID and social security card and a High school diploma and have a true love and compassion to work with our elderly residents. On the application you will need to submit a letter stating why Norridge Garden’s should choose you for our Free program. You must be willing to work in our facility full time on the shift that is available after graduation. After we receive your application we will hold them until our next class will be starting then if your application is chosen we will Call you for a personal interview. At time you will be asked to complete a short math and reading test, along with a personal interview. If you are chosen, you will be in our certified nursing assistant class and have the wonderful opportunity to work in the field of geriatrics! During the program you will be working in our facility part-time and then when you graduate you will be working full time on the shift that is available here at Norridge Gardens. After graduation you will need to take a State Competency exam that will certify you as a Certified Nursing Assistant. We know that you have a valuable contribution to make to our residents and to our facility. We thank you that you have selected us help you achieve your goals. Please click here to apply online to the CNA training program.